Hereditary (film, 2018). A 2018 American horror film with "R" rating by A24. Directed by Ari Aster. Official Trailer. Hereditary is a 2018 American horror film directed by Ari Aster. 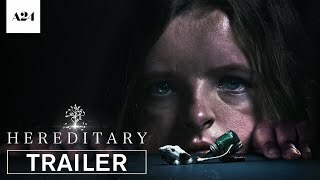 Hereditary | Charlie | Official Trailer 2 HD | A24. Annie Graham is a miniatures artist who lives in Utah with her husband, Steve; their 16-year-old son, Peter; and their 13-year-old daughter, Charlie. At the funeral of her secretive mother, Ellen Leigh, Annie delivers a eulogy explaining their fraught relationship. A week after, Steve is informed that Ellen's grave has been desecrated, while Annie thinks she sees an apparition of Ellen in her workshop. At a support group for the bereaved, Annie reveals that the rest of her family suffered from mental illness that resulted in their deaths. To attend a party, Peter lies that he is going to a school event, and Annie forces him to take Charlie with him. Unsupervised, Charlie eats cake containing nuts, which she is allergic to, and falls into anaphylactic shock. As Peter drives her to a hospital, Charlie leans out of the window for air. Peter swerves to avoid a dead deer and Charlie is decapitated by a telephone pole. In shock, Peter silently drives home and leaves his sister's corpse in the car for their mother to discover the next morning. The family grieves following Charlie's funeral, heightening tensions between Annie and Peter. Peter is plagued by Charlie's presence around the house. Annie is befriended by a support group member, Joan. Annie tells her she used to sleepwalk, and recounts an incident in which she woke up in Peter's bedroom to find herself, Peter, and Charlie covered in paint thinner with a lit match in her hand. Joan teaches Annie to perform a séance to communicate with Charlie. The film Hereditary was scheduled to be released by A24 on January 21, 2018 (Sundance, 2018 Sundance Film Festival), on June 8, 2018 (United States) and on June 14, 2018 (Germany). The duration of the film is 127 minutes. With a budget of $9 million, the film grossed over $79.4 million. Hereditary got high rating from critics. The audience also likes the film. Audiences polled by CinemaScore gave the film an average grade of "D+" on a scale ranging from A+ to F.